July 6 Update: Creators can choose to earn cash and credits as percentage of their sales. IMVU has a thriving Content Creator community which makes our Shop brim with 16+million products - the largest virtual catalog in the world. We appreciate and celebrate our Creators and as stated earlier in the year by IMVU’s CEO Brett, want to enhance and enrich the Creator program by leaps and bounds this year! We started off by first responding to your long-standing requests to make the Creation process easier and today we are here to announce a change to the way you earn real-life money for your creations to set you and us for the future! Effective immediately, our Content Creators will be able to earn money directly from IMVU for selling their products. Due to several business reasons, we have concluded that we need to sunset the current reseller program where authorized resellers bought Credits from IMVU Creators in exchange for money and sold those Credits to other IMVU customers. As IMVU Creators, starting today, you can start earning money (cash) directly from IMVU for any products you sell. You will be able to earn money for your virtual product sales at a consistent rate, from a single, reliable entity i.e us, and with full support of a dedicated team of representatives to assist you with the process. Of course you can always choose to earn IMVU Credits for your sales and use them to enjoy your IMVU experience. As IMVU customers, you can continue to purchase any Credits you need directly from us again knowing there is one source to buy Credits from - IMVU. IMVU’s Credit store is available 24/7, offers a variety of payment methods in all countries, and has our billing help team available to lend assistance if needed. *Resellers have already been notified of this transition and are expected to follow their routine processes for all transactions. Plus, in order to facilitate this transition, we are accelerating the pend on purchases that are currently in pend and set to deliver now through April 23rd. Those purchases will now be delivered to you by April 12th at the latest so you have an opportunity to sell them to resellers. -Credits that would have delivered from pend on April 19th will now be available on April 8th. -Credits that would have delivered from pend on April 20th will now be available on April 9th. Last day of such accelerated delivery will be for Credits that would have delivered by April 23rd and those will be available on April 12th instead. All later deliveries (purchases made on or after April 9th) will again be subject to 14 day pend period. Get details about the process and start earning money from IMVU here. To ensure our hard-working Creators can earn money for their creations consistently, reliably, and easily; and to get them ready to earn money via new earning opportunities in the future. These new earning opportunities will have requirements as to how we manage our Credit economy. First and foremost, we needed to re-evaluate the current (and expected) requirements by our partners regarding the way our Credit economy currently works. It was clear that we need to have a more direct relationship with our content Creators in the context of them earning money for products they sell in our Shop. 1) Creators make money with a reliable, consistent and easy process. --You will keep earning money from IMVU for your product sales and request payouts - once you have verified your account (a one-time process). No need to check every time whether you can sell your Credits or not. --You will earn money at a standard and consistent rate of **40 cents/1,000 Credits based on the profits you have set for your products (example: for a product where you profit is 100 Credits, you will earn 4 cents every time someone purchases that product with Credits). No need to worry about what rate you get for every sale. IMVU’s rate of $0.40 was determined in order to match with or improve upon typical reseller transaction rates. **Though IMVU reserves the right to change this rate, we do not anticipate doing so frequently or in the near future. --You can monitor your cash earnings for each product sold - just like you can do so for Credit earnings. --You will get all payouts easily to the PayPal account you designate. --You will have more than one option to determine the nature of your profits. You can easily switch your account to earn Credits or cash payments at any time. All sales after you make the switch will honor your selection. Many of our hard-working Creators tell us often how they compete for sales with bad actors - Creators who try to sell stolen/copied or inappropriate content and profit from such activities. 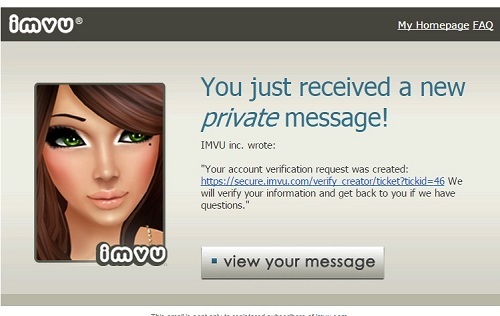 Now every Creator who wants to earn money from IMVU will have to go through a proper account verification process which will include a review of their catalogs. IMVU is moving onto platforms where more and more of our customers are consuming our experience: browsers, tablets, smartphones and more. We want to ensure our current and future customers can stay connected to their IMVU friends and content no matter where they are and how they access IMVU. It is critical that our valuable Creators are part of our future. Our Credit economy and payment systems have to comply with requirements of these new platforms. As of today, thanks to the way we will now allow Creators to earn money, we will have better control of our Credit economy and our Creator program will continue to thrive on any and all platforms and meet all current and future requirements. Plus establishing a way for IMVU and its Creators to have a way to exchange skills and money directly means we are set for not just the current shop-based transactions but also for the future. This year, we plan to enhance our current Creator program even more with additional and new types of creation opportunities available for our Creators. Think IMVU games, interactive experiences, 2D and 3D content to enhance IMVU messages, and even entirely different types of products for our Shop! We want to ensure creators who make and sell the new types of products and content can easily receive cash payments for their skilled work! We also want to explore ways to allow community members to earn real-life currency in ways other than selling products sold in the catalog. The new Creator Payments page will be your one-stop shop to elect your catalog to earn money (or Credits) from IMVU, complete account verification requirements, check your payout balances, and request payouts. IMPORTANT: All Creators are set to earn Credits by default unless they choose to earn money. Make your selection today if you wish to start earning money for your sales directly from IMVU. All earnings (Credits and money) will continue to be subject to a 14-day pend period. There is no change to the way purchases with Promotional Credits are processed - there is no pend and Creators receive Developer Tokens for such sales. All derivation fees (the one time fee paid to the Creator/mesher whose product you are deriving from) will continue to be paid in Credits only. REVISED: Effective 6 PM on April 16th, derivation fees will also be paid in money if the Creator/mesher has elected to earn money. There is no change to the way you set profits for products or to the way payouts are distributed across the derivation chain. You will NOT be able to transfer accumulated Credits or Credits acquired through a source other than product sales to IMVU to get cash payouts - all payouts will only be at the time of each sale for your products and earned accordingly (the way you currently earn Credits). A derivation chain may contain Creators who have elected to earn Credits as well as Creators who have elected to earn money. Payouts will be distributed accordingly at the time of each sale of such products. Go here and sign the updated Creator Agreement and Policy. **You must agree before you can elect to earn money for your sales. **Note that the Creator Agreement uses the term “Royalty” to denote cash earnings for product sales. Select the “Earn Money” option to set your catalog to start earning money for your sales going forward. Your past sales including Credits that are currently in pend will not be affected. **You may switch between Credits and Money as your earning option at any time. **You only need to do this once. **You do not need to verify your account if you do not wish to earn money but continue to earn IMVU Credits for your sales. All Creators will need to supply us with their full name, physical address (no P.O. boxes), phone number and PayPal ID. *US Creators must supply us with a completed W9 form in order to get payouts. *Non-US Creators may choose not to supply us with completed tax documents (W-8BEN form), however, in that case all their payouts will be subject to 30% withholding. Creators from countries that do not have a tax treaty with the US do not need to file W-8BEN form, their payouts will always be subject to 30% withholding. Get more tax-related information here. 1] Go to verify your account here. **Non-US Creators must submit their full name, mailing address, Paypal ID and completed + signed W-8BEN form. (If the tax-related document is not submitted, all payouts will be subject to 30% withholding). 2] Click on Provide Information for Verification to proceed. Complete the required fields, attach tax-related documents, add a comment if needed and click Verify Account to submit your request. 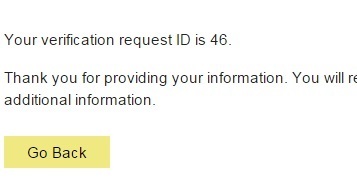 3] You will be assigned a unique verification ID for your request and will receive a confirmation message (and email) to notify you that your request has been received. 4] You will receive a confirmation message once your account has been verified or if we need any additional information from you. 5] If you have any questions/concerns related to earning money for your sales, you may submit a new ticket via this same process. **Please use our Help Center if you need any other assistance related to your IMVU account, program, creation process etc. Those will not be handled here. Account verification must be complete and you must be approved before you can request any payouts, however, you can start earning money for your sales while the process is ongoing. Monitor your payout balance - pending as well as available. To request a payout, go to the Creator Payments page and use the Payout Request link to proceed. You will be prompted to provide your PayPal ID, phone number, as well as the desired payout amount (as long as your available balance is above $50). IMVU has a team of representatives in our corporate offices dedicated to the Creator program and will review all payout requests and process them by depositing the payments in your PayPal account. Your Creator Reports will continue to have information related to any sales which earned your Credits or Developer Tokens (promotional credit purchases). Your Creator Payments page has a new downloadable report which will give you details for sales that earned you money. The reseller system works right now so why are you changing it? --Current and expected requirements from IMVU’s partners as well as new platforms that we are expanding the experience on. --Take the opportunity at the same time to address community concerns such as product theft. Why can’t I sell Credits to you for cash like I do now instead of earning cash per sale? The same requirements from partners and platforms need us to have an economy where money is paid out for distinct transactions i.e. product sales in IMVU’s case. We will not be an exchange of Credits for cash without knowing the exact source of those Credits. What about the current resellers? All authorized resellers have been notified and informed that they can continue to purchase Credits from IMVU’s Creators through April 14th and then also continue to sell them to IMVU customers through May 12th. We will be working closely with all resellers during this transition period as and when they need assistance. What do I do with the Credits I have right now? You can continue to sell your Credits to current resellers through April 14th. You can also continue to enjoy those Credits for your own IMVU experience - shopping, chat room decorating, creating, etc. What about Credits that I have earned but are currently in pend? To facilitate the transition and allow you to have access to your earned but pended Credits faster, we have temporarily accelerated the pend period from the standard 14 days to allow you to access all your earned Credits in case you need to sell them to a reseller by April 14tth. We are accelerating the pend on purchases that are currently in pend and set to deliver now through April 22nd. Those purchases will now be delivered to you by April 12th at the latest so you have an opportunity to sell them to resellers. -Credits that would have delivered from pend on April 17th will now be available on April 8th. -Credits that would have delivered from pend on April 18th will now be available on April 9th. Last day of such accelerated delivery will be for Credits that would have delivered by April 22nd and those will be available on April 12th instead. Am I earning money automatically for all my products? No. All products are currently set to earn Credits by default. Each Creator will need to switch the earning method to money by going here. Whatever your selection is will be applied to all your current and future products - unless you change it. I set my catalog to earn money, why did I just get Credits? The switch only applies to sales going forward. If you elected to earn money for your products today, any Credits you already have earned and are in pend will still be delivered to you. Why do I need to sign a new Creator agreement? In order to earn money directly from IMVU for your product sales, you need to sign the updated Creator Agreement and Policy as it now lists terms for such transactions. You may review the agreement here. When can I start earning money from IMVU for my sales? Today! Just go [urlhttp://www.imvu.com/creator/payments/]here[/url] to switch your catalog to start earning money and get your account verified. What do I need to do to earn money? -Go here to sign the updated Creator Agreement and Policy. 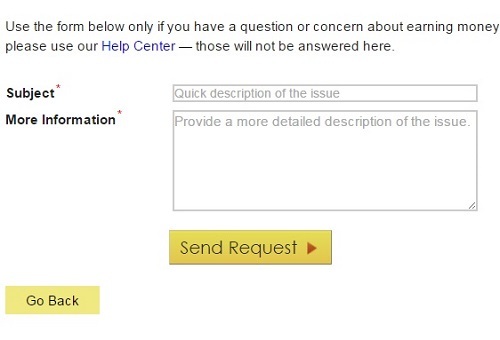 --Go to the Help Center and use the newly added Creator Support category of “Creator - Earn Money” and choose the topic of “Required Information” to fill out the form with your information. --Watch your payout balance grow here. --We will contact you once your account is verified based on the information you provide (we will of course contact you if we need additional information). --We will process your payout request and send the amount to your Paypal account. What happens when I switch my earning method from Credits to money or money to Credits? Does that trigger peer review? You are free to switch between Credits and money as the earning method for your sales at any time. You can do so here. This change does not make the product go through peer review. Please note, once you make the change, all sales AFTER your change will earn Credits or money depending on your selection. You only need to verify your account once. We do anticipate a high volume of account verification at the start of this project - beginning April 8th. Each review includes verification of tax information as well as a review of the catalog for copied and inappropriate products. As such we anticipate us taking a few days to process each verification request at the start. The process will be a lot faster as more Creators get verified. Payout requests will be processed in the order they are received. Depending on whether that account is already verified or not, we do expect an initial delay in processing the requests (up to 2-5 days). Yes, any and all information you provide as part of this process will be entirely secure and used only for the intended purpose i.e account verification. We have designed a multi-level secure process to ensure your privacy. Will the process be automated in the future without the need for help tickets? Yes! Our team is currently working on making this a lot simpler. How do I complete the tax forms? You can print them and fill them in, sign them and scan them to attach them to your help ticket. You can fill them in using a PDF editor, save it and attach it to your help ticket. What about sales with promotional Credits (predits)? There is no change to predit purchases. If someone buys a product with predits then all Creators in the derivation chain will continue to earn developer tokens for their profits. Starting April 16th, fees that a Creator pays at the time of deriving a product from another Creator will also be paid in money if that Creator has chosen to earn money. Does the buyer of a product see any change? No. IMVU customers can buy products in the Shop with Credits as is the case now. Creators get paid in Credits or money depending on their own selection. Are there any other changes to the creation process? No. There are no changes to the creation, submission, derivation, peer review, flagging, etc of a product. You will need to verify your account only once when you elect to earn money for your sales. Your account must be verified before you can request a payout (though you can start accumulating earnings while you are doing the process). To verify your account go here and complete the necessary information. You will be prompted to enter your full name, physical address, paypal ID, and tax-related documents (US-based Creators must attach a completed W9 form). Our team will review your information as well as your products and account and notify you whether your account is verified or not. What does account review include? As part of the account verification process, we will review the catalog of that Creator with respect to products that involve copying of assets/animations from others as well as products that do not meet IMVU’s policies. If the account verification process is not successful that account will not be able to earn money for their sales but may continue to earn Credits. Further action such as revoking creator privileges or ban may result as well. Can I combine earnings for my multiple accounts into one? As to today, you will have to verify each of your accounts and accumulate cash balances for payouts when they reach $50. You can however use your single Paypal ID for all those accounts. We realize that this may be a feature that is important to many of you and do have plans to allow linking of accounts to collect earnings from all accounts into one in the future. In case we do so, we will using our current Extended Creator Reports system for you to link accounts. The process is free to use and we encourage you to start linking your accounts there. Who is doing account verification and payouts? Why do I have to file taxes? As per IRS requirements, IMVU is required to collect your information and provide appropriate documentation to IRS annually. You need to consult a tax adviser regarding your personal income level and what taxes you may need to file etc. We are not giving tax advice to anyone. However, we have assembled some information including relevant resources/websites available here. What information do I need to provide if I am a US person? Your full name, physical address (not PO box), phone number, Paypal ID and a completed W9 form. Please refer to this post for additional information related to tax documents. What information do I need to provide if I am not in the US? Your full name, physical address (not PO box), phone number, and Paypal ID always need to be prvided. If the country you reside in has a tax treaty with the US, they you can submit a completed W-8BEN form. Please refer to this [post for additional information related to requirements that may vary based on the country of your residence. Please note that non-US Creators filing the W-8BEN and from a country that has a tax treaty with the US is subject to a withholding rate based on that country. For international Creators only: If you do not provide us with tax-related documents (other information is still required), or if your country does not have a tax treaty with the US, you will be able to request payouts, however, we will withhold 30% of each payout as per IRS requirements. (example: if you request a payout of $50, we will deliver $35 to your Paypal account - provided you have sent us other information and your account is verified of course). Why do you need my information when the resellers did not? The tax jurisdiction we work within obligates us to require this info. Resellers were and are independent companies subject to, we presume, different tax laws depending on the jurisdiction in which they operate. We can not comment on the practices and procedures of independent firms. If you are minor on IMVU and are creating products for the shop, then please have your legal guardian (who also agreed to let you use our site as per our TOS) provide the necessary information to verify your account for earning money from IMVU. What is pend and available balance? All earnings are held in pend for 14 days. At the end of the 14 days, the earnings in pend are moved to available balance (at exactly the same time as when then sale was made). Your available balance must be $50 or higher before you can request a payout (and you must have verified your account). What is the rate for earning? This is how it works based on the profit you have set for yourself. No. More you sell, more you earn - provided your account is verified. Your payouts may get capped by MASA (see Creator Agreement) and/or $10,000 per month cap - whichever is lower. The minimum amount for a single money payment by IMVU to a creator is US$50 (the "Minimum Payment Threshold"). The maximum amount for a single money payment by IMVU to a creator is [US$10,000]. The aggregate amount of money payments from IMVU to a creator in any 30 day period is subject to a cap equal to the lesser of US$10,000 or to that creator's monthly average sales amount ("MASA") over the most recent 12 full calendar months. The MASA for a creator is calculated by taking the total aggregate number of IMVU Credits that are attributed to the creator under the product derivation chain for all bona fide sales of virtual items from the IMVU catalog for most recent 12 full calendar months, multiplied by the Royalty Rate (as established by IMVU from time to time), and divided by 12. IMVU reserves the right to waive or raise the maximum monthly payment limitation for any creator, in IMVU's sole discretion. Why is there a minimum of $50 for payouts? 1) We want to avoid multiple small-value transactions to ensure our payout process is efficient and cost-effective. 2) Our review of current reseller operations and Credit selling activity by Creators led us to arrive at this number for minimum payout request amount. We will be carefully monitoring the process and may make adjustments in the future. Processing times vary and we process all requests in the order they are received. Each payout request is reviewed and processed as soon as possible. We have a dedicated team available in our corporate offices to process these requests. We have chosen Paypal as a way to pay Creators for their accumulated money earnings because a) Paypal is widely available in over 200 countries and is free to set up b) current resellers have been using Paypal to make their payments for Credits purchased. 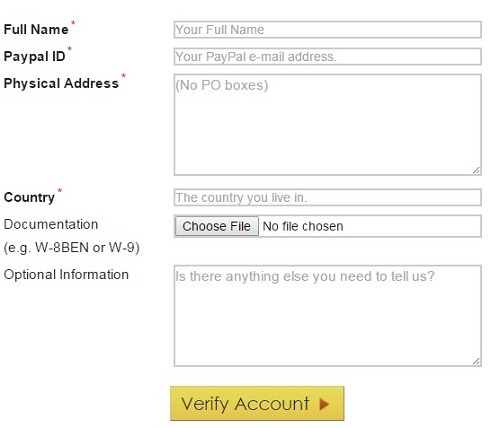 If you wish to earn money from IMVU for your product sales, you must provide us with your Paypal account ID. Paypal accounts are free to set up and available in over 200 countries. Please visit their website to set up an account. Are there transaction fees for payouts? Yes, we charge a $5 fee for more than two payouts paid in a 30-day time period. The first 2 payments do not have a fee but 3rd and later do. During the initial launch of this program, we had waived this fee but it is being applied now. What if I don’t verify my account? You can continue to create and submit products to our shop and earn Credits (not money) for your sales. You can use those Credits for enjoying the IMVU experience via shopping, gifting, decorating rooms etc. You will however not be able to sell those Credits to IMVU or any other entity. Why is my payout less than what I asked for? If you are a non-US Creator and have not supplied us with appropriate tax documents or if your country does not have a tax treaty with the US, all your payouts will be subject to 30% withholding as per US government tax laws. So, if you have requested $100 in payout, you will receive $70. If you are a non-US Creator who is from a country that has a tax treaty with the US, your payouts will be subject to a rate depending on that country (less than 30%). Do I get paid automatically? No. You must request a payout (if your account is verified already and you have at least $50 in your available balance). What if I start accumulating money for my sales but later my account does not successfully verify? This information is all in English, What about people who speak other languages? In the next few days, we will be making the information contained in our forum posts available in our non-English language forums. We will also be translating all website pages related to earning money into all the languages that we support. What about Creators who don’t read forums? A message is being sent to all active customers of IMVU on April 8th notifying them of this change. Please note that this forum section is available even without logging into IMVU and thus all current customers of IMVU will be able to access the information irrespective of their forum access. We will also have Knowledgebase articles in our Help Center available shortly. Where are my Credit sales? The report included on your Payments Page only includes those product sales which have earned your money from IMVU. For any past sales which earned you Credits please visit your Creator Reports. Are tiers affected based on whether you earn Credits versus money? No. Tier calculation process does not change. I want some Credits in my account. What do I do? You may purchase Credits from IMVU or switch your catalog to earn Credits (instead of money) till you have earned enough Credits to meet your needs. I am not a Creator, can I sell my Credits to IMVU? No. IMVU is not purchasing Credits from any community member. Creators who sell products in our Shop can however earn money (or Credits) for any product sales they have at the profit level they decide. Everyone is set to earn Credits by default unless they choose to earn Money after today and get their account verified. Inactive accounts will continue to earn Credits for any sales they have. What if my VIP lapses? If you are a non-grandfathered Creator who is required to have VIP to maintain their Creator status and if your VIP membership lapses, then you will continue to earn money or Credits (depending on your selection) for any sales you have. Can I still gift and receive Credits via Credit transfers? Yes. There are no changes to that process. Discussion related to this announcement can be conducted here. UPDATE regarding account verification process. As per our earlier update, the system for account verification was under maintenance. That continues to be the case right now and we want to extend our sincere apology for the inconvenience. We know you are anxious to start getting cash payouts after verifying your account. We will have an easier way to do so starting Monday. Please check here an update on exactly how that process will work. The information that you will be asked to provide is the same - your full name, physical address, paypal ID, and tax-related documents. If you started the verification process prior to Friday, then our team is processing those requests. 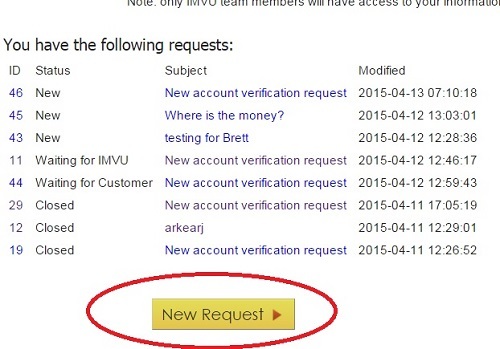 You will be receiving a message in your IMVU Inbox when you have been verified of if we need more information. 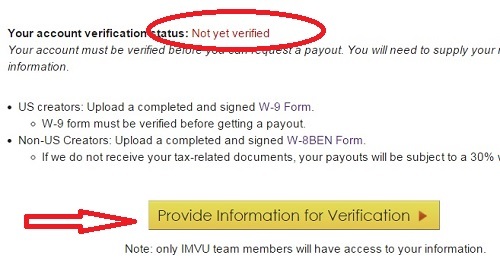 Effective immediately, all IMVU Creators can use an easier process to verify their accounts in order to request cash payouts for their product sales. We heard your feedback and decided to speed up our planned work for a later phase of this project in order to address it. Our Creators want to verify their accounts and request payouts right on our website where they select to earn more and now you can. The new process is not final (translation pretty!) in terms of how it looks and we will be improving those aspects over the next few weeks and incorporating your feedback. Any and all information submitted via this process is entirely secure and encrypted.